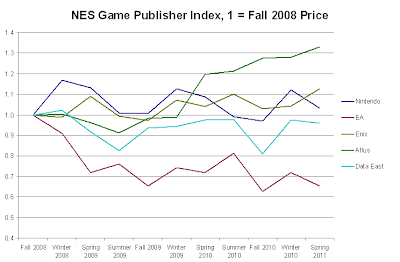 NES Price Index: Which NES Publishers Are Hot, Which Are Not? Thanks to JoneBone for doing all the analysis and writing this article. Many collectors are already aware that game values can fluctuate greatly over time. Sometimes a title may get 'hot' with a re-release of a classic (like Zelda Ocarina of Time), or a title can cool off when the supply exceeds the hype (like Final Fantasy VII). Do game publishers undergo these same fluctuations too? Yes they do. The chart below shows the average price of all the Nintendo NES games released by a publisher. The price has been indexed to start at 1 on Fall 2008 so you can see relative price changes. Right away you should notice that Capcom and Hudson Soft prices are up substantially from their Fall 2008 levels. Each has classic franchises in Mega Man and Bomberman, and each has at least one rare in Snow Brothers and Bonk’s Adventure. Taito is also pretty hot now after experiencing a cool period in early to mid 2009. Its recent run has been driven by hot rares such as Bubble Bobble 2, Flintstones 2, Little Samson and Power Blade 2. Then there’s the middle of the pack publishers like Bandai, Konami and Tecmo which have all bounced around slightly over the years. Many popular titles between the three, but only Tecmo has Fire N’ Ice as a rare. Finally you notice that SNK has actually decreased substantially over time. Though Baseball Stars and Ikari Warriors can be quite popular games, collectors simply haven’t been willing to pay a premium for them. Other publishers were considered for this analysis, but these are some of the most popular. One has to wonder if this data is merely coincidental, or are there really collectors out there who enjoy completing a publisher sub set? Personally I believe it to be the latter, as a collection of purple border Capcom games or early bubble lettered Bandai titles (Chubby Cherub, Ninja Kid, etc.) looks better than you think. Publisher specific sub collections also are quite attainable goals, even for those collectors with tight budgets to maintain. The chart below shows more publishers including Nintendo, EA, and Atlus. Atlus games have increased in value while Nintendo games have stayed the same. Hey Travis it's me Metaldave, please go to my site and re-enter my 3DS friend code on my "about me" section. I had to get a new 3DS with a different friend code since my other system broke. Thanks man and I hope you're doing good! @anonymous - Ask you shall receive. 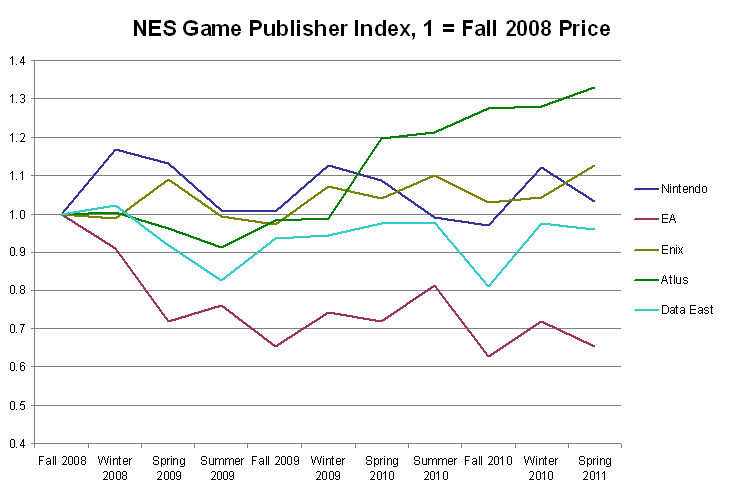 I added a chart showing Nintendo and a few other publishers too.